The 58-room Hotel Skyler Syracuse, Tapestry Collection by Hilton provides a private sanctuary that is relaxing yet invigorating, with plush, thoughtful amenities that are simultaneously eco-conscious. Guests will find the perfect mix of funky and fancy in this unique retreat. Fresh and fun, the eclectic mix of mid-century and modern in the king room will remind guests of their Aunt Rosie’s lake cottage, but kicked up one very big notch. With plenty of room at the desk for work or snacks, and lush eco-conscious bedding on the king-size bed, guests will fall asleep dreaming of simpler times and wake up energized for all of their 21st century endeavors. Sleeps 2. Room to move and space to groove. There is not only a peaceful bedroom with a king-size bed and flat-panel TV, there is also a sensational sitting room, decorated with freewheeling panache and another TV, plus a clean-lined desk with an Aeron chair. The spacious, captivating king suites lets guests stretch out, breathe in, and dream big. Sleeps 2. 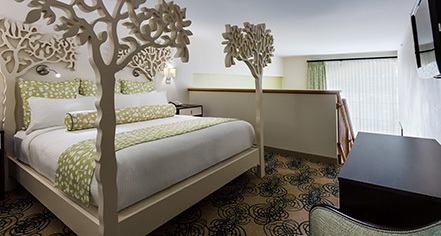 This room is inspired by the two-story treehouse at the nearby Golisano Children’s Hospital. To honor this special place, a percentage of the revenues generated from the Treehouse Suites will be donated to the hospital. Treehouse Suites feature a king-size bed in a loft sleeping area, and sitting room with a pull-out sofa and second TV. Sleeps 4. Fresh and fun, the eclectic mix of mid-century and modern in the king room will remind guests of simpler times, but kicked up one very big notch. With plenty of room at the desk for work or snacks, lush eco-conscious bedding on the king-size bed, and a comfy sofa with a hide-away bed, guests will fall asleep dreaming of the good life and wake up energized for all of their 21st century endeavors. Sleeps 4. Enjoy the same attractive amenities of standard guestrooms plus features accommodating accessible needs. Each of the Accessible Rooms has a minimum 40-inch clearance on all doorways and between furnishings, making chair maneuvering easy. Baths offer roll-in showers with grab bars and handheld shower heads, while vanities are constructed to provide convenient access. This mobility and hearing accessible standard room features one queen-size bed, a roll-in shower, complimentary WiFi, 40-inch HDTV with cable programming, alarm clock, hairdryer, iron, safe, and energy efficient LED lighting. Sleeps 4. The unique cut-out headboards on the two comfy queen-size beds signal a departure from ho-hum, and the rest of this spacious guestroom follows suit. 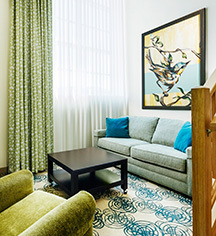 Taking its cues from nature, the queen room has vibrant punches of color, pattern, and texture. The contemporary bath, complete with a walk-in shower, provides a soothing spa-like refuge. No two rooms are alike – try them all to find a favorite! Sleeps 4.